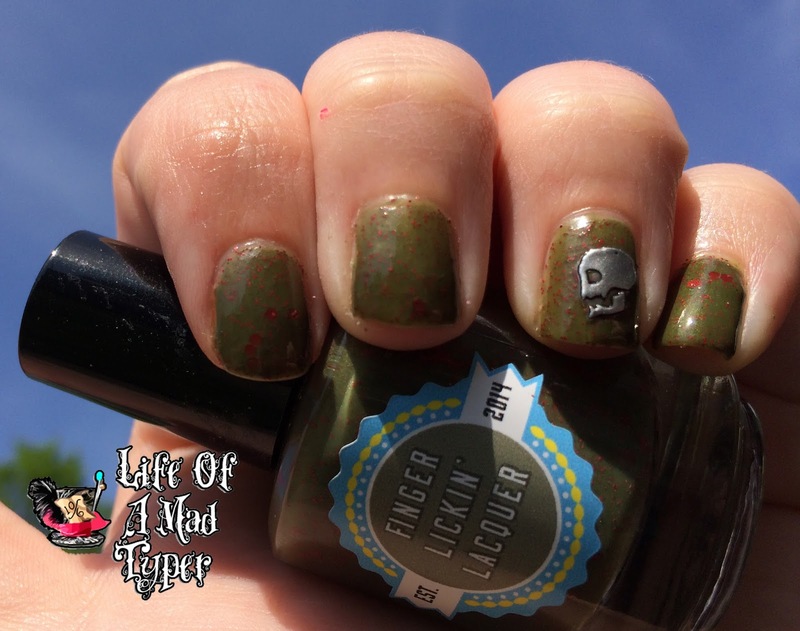 Finger Lickin' Lacquer specializes in scented polish but don't worry all you that are sensitive to smells she offers unscented as well. 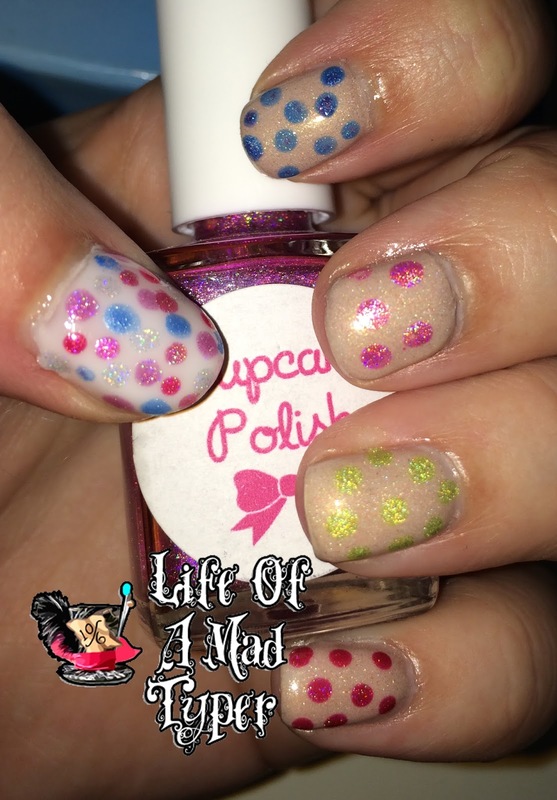 I have never tried a scented polish and I have a funny story for you! 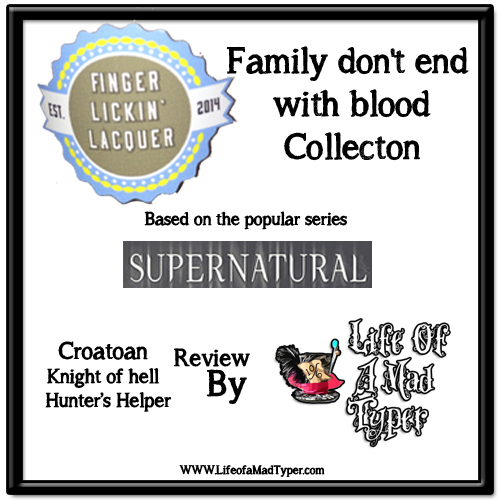 I put Croatoan on first during swatching. I have a bad habit of touching my face, I do it without thinking. Well I had my hand on my face and I was so tired at this point I was about to go to bed so I could go to work that night. I kept smelling something that smelled like leather and water (thats how my brain picked it up) and I couldn't for the life of me figure out where it was coming from. After about 15 mins of being puzzled I realized what it was! I laughed at myself and now you can too! Croatoan is the zombie virus on Supernatural. I have never watched the show but I do plan on watching it on netflix to catch up (if its available) this summer while I am waiting for all my shows to come back on TV. 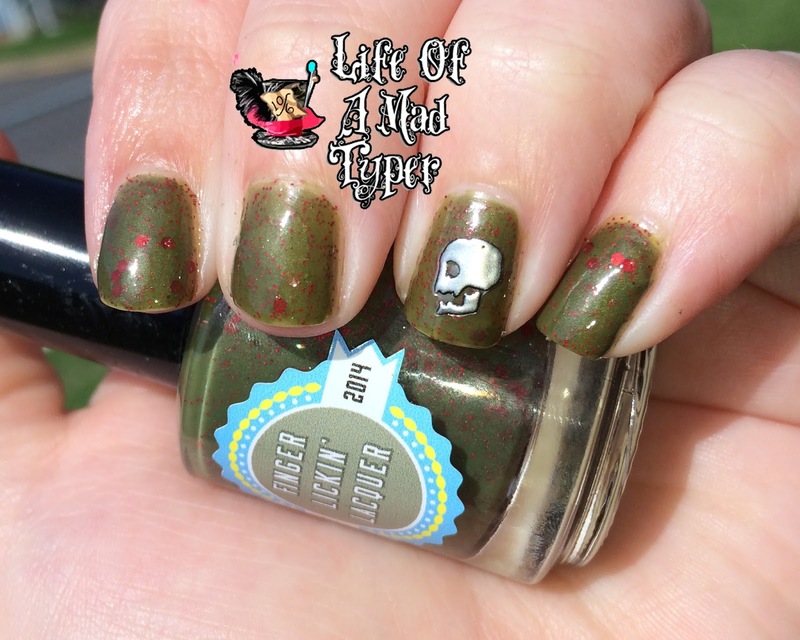 This green with leave you thinking of zombie skin and the red as blood splatter. Also a great color to pair with a camo outfit as pointed out by Connie. You know me I am a sucker for anything Holo or glitter. Next I swatched Hunter's Helper a whisky scented polish from the collection. I am not a drinker so I don't know what whiskey smells like but this smells deliciously sweet, I don't know how to describe it. I can tell you how ever I loved it and looked odd smelling my fingers at work. When people asked me what I was doing I said "Smell my fingers!" and they gave me weird looks but they did it. None had a complaint about any of the scents. 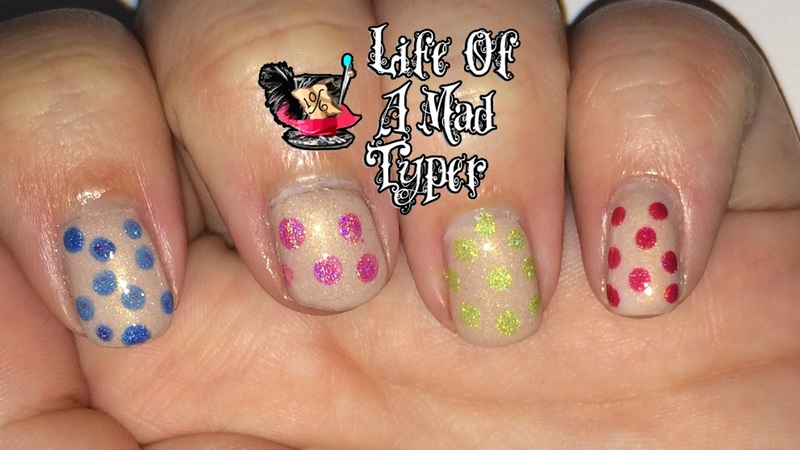 This is my first neutral holo and I got a little dot happy putting different colored holos over the top. 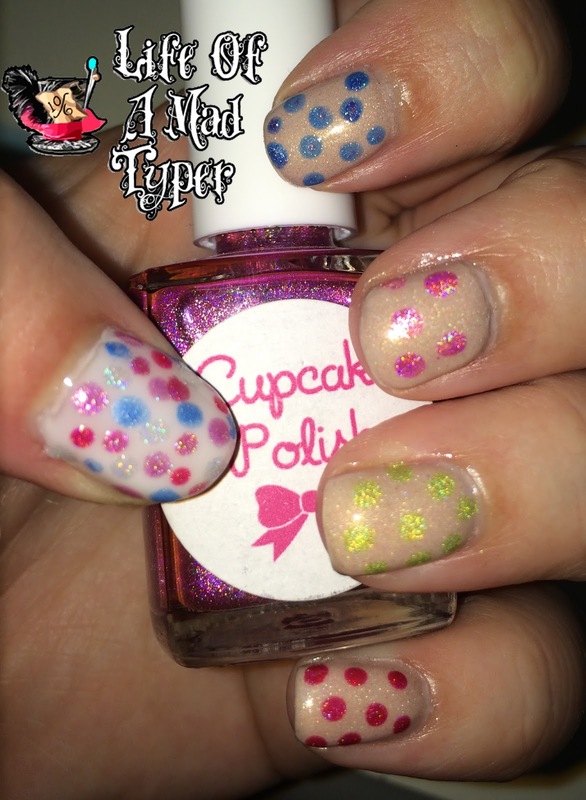 The holos are (from left to right) Glam glaze,Cupcake polish, Nabi, KB shimmer. 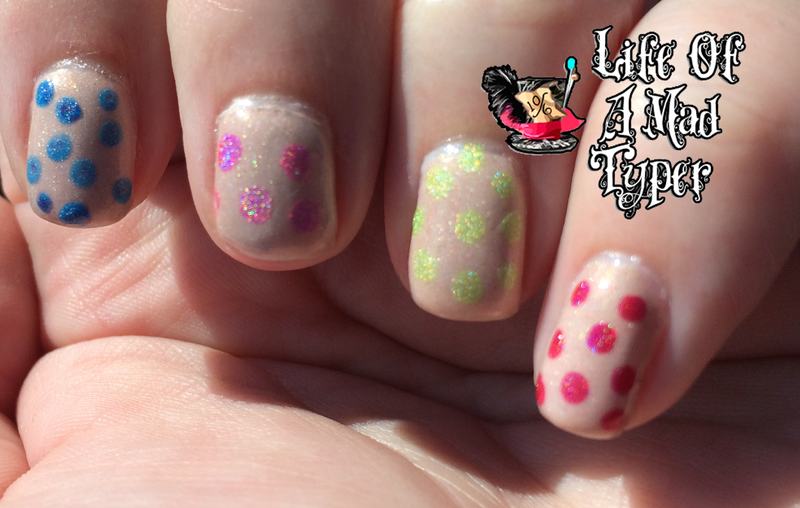 I can see me having a lot of stamping and nail art fun with this one. Knight of hell was actually my favorite scent of the 3 I swatched. To me it smells of cinnamon which is amazing because I love the smell of cinnamon. Not normally a color I would choose for myself I actually fell in love with it. 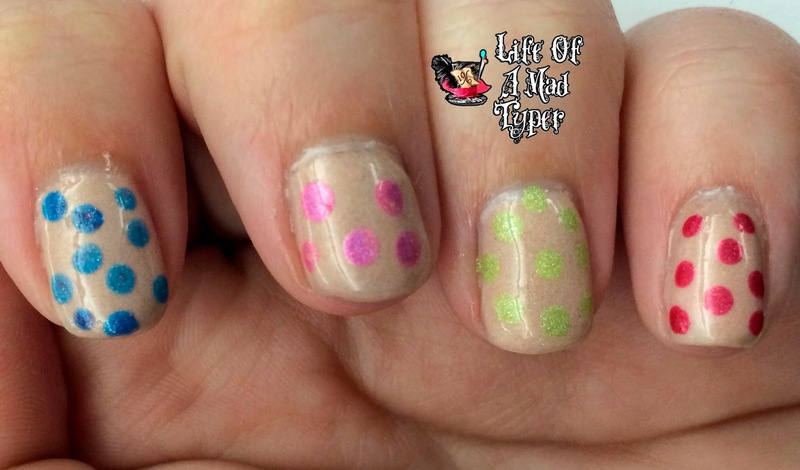 I used 2 coats of each of these polishes for the swatches. They applied evenly and without issues and dried quickly. I am impressed with the formula so don't be fooled by the fact she just launched this girl has obviously done her research and practice before launching. The holos are scattered holo and gorgeous. I find myself wanting the Cherry pie polish from this collection. 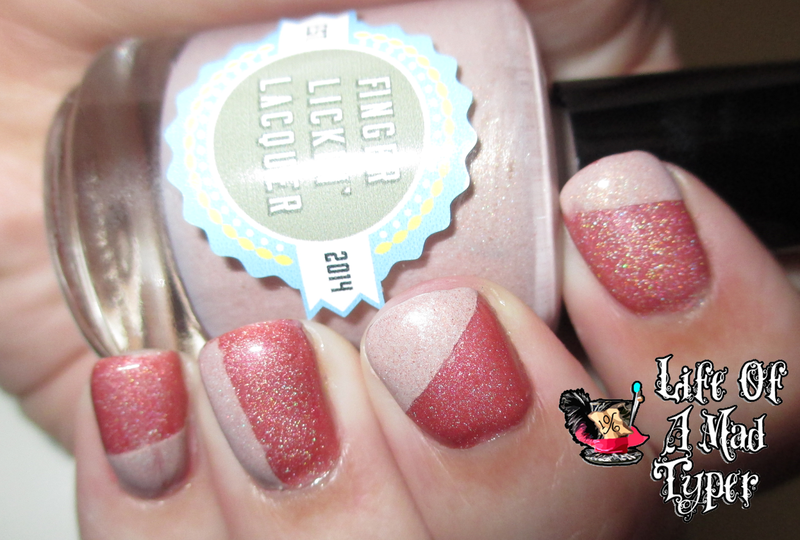 I have added Finger Lickin' Lacquer to my indie must watch list! 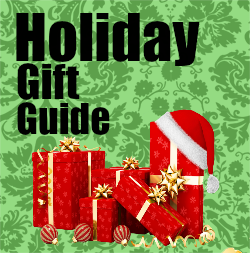 SEASONTEN gets you 10% off of any order $10.00 or more! Active until July 20th! This collection is available for pre-order now but will begin shipping on May 20th. See our review of Cherry Pie from the same collection. More pictures and more nail art. I hope you don't mind my nubs. I am trying to get them to grow back out as fast as possible but its going to take some time. I am just glad to have my middle finger look somewhat normal again.